Equipped with a plastic top case which is 5.9gr lighter. We inherit the smooth and linear operation unique to RSx and anyone can easily drift. 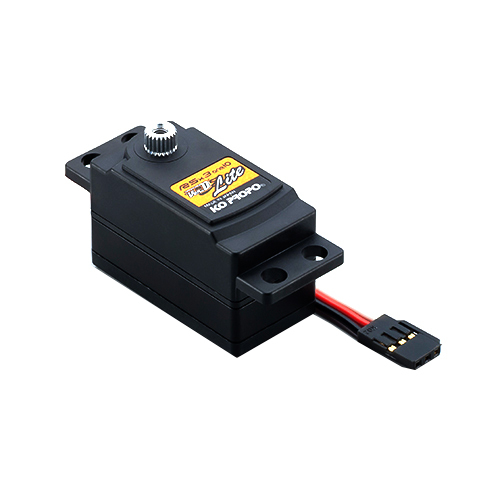 Vibration of Servo, which is easy to occur when using a gyro with 2WD drift, it will be not happen with RSx 3-one 10 VerD. Five types of data that match various road conditions and usage are already installed. Commitment also extends to servo wire. The appearance and tightening black cable has the softness optimum for handling while securing the necessary current capacity. Compatibility with drift gyro gyro KG-X is outstanding. HCS( High Speed Communication System) is the new high speed communication system between the receiver to the servo. The HCS mode shortens communication time of the signal which is compressed. HCS compatible servos are changing mode automatically by signal from receiver. So HCS compatible servos can use with all receivers. Installed preset setting of 5 models. You can change each model by Servo model selector for fit to your car or track easily. It is useful for bigginer to expert drivers, evryoone can setting for situation of track. Model1 Easiest: can most easy operation. Model2 Easy: can easy operation. Model4 Fast: Quick, need sensitive operation. Model5 Expert: most quick, recommend to expert drivers.